It’s endless if we talk about Russian nature. All landscapes are available there. Beautiful beaches, amazing karst caves, charming spits, beautiful forests, and mountains that truly fascinate. Besides Maly Semyachik Volcano, which is quite popular, Russia also has another stratovolcano volcano that is no less impressive. Namely Mount Elbrus, the highest mountain in Europe. Mount Elbrus is a mountain located in Russia, near the Georgian border. This mountain is located in the southern part of Russia. Mount Elbrus has a height of 5,642 meters which is around 18,510 feet and is the highest mountain in Europe. This mountain is a type of stratovolcano that is not active. Mount Elbrus is in the Caucasus Mountains. This mountain is very popular among climbers, especially European climbers. Because climbing on this mountain is quite safe, this mountain is no longer active. And this mountain is a landmark for the Russian state and is a pride. You certainly can’t wait to learn more about the facts of Mount Elbrus. Here we have provided 7 facts about Mount Elbrus – the highest mountain in Europe. Mount Elbrus has two peaks which are the dome of an inactive volcano. The western peak is higher than the eastern peak of this mountain. The western peak has a height of 5,642 meters or about 18,510 feet and an eastern peak of 5,621 meters or about 18,442 feet. The eastern peak was first climbed on July 10, 1829 by Khillar Khacirov. And the western peak was climbed first in 1874 by a British expedition led by F. Crauford Grove, Horace Walker, and Swiss guide Peter Knubel. Kahcirov is a guide for the Russian army scientific expedition led by General Georgi Emmanuel. 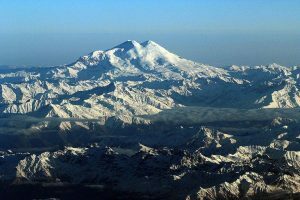 The next interesting fact is that Mount Elbrus was formed more than 2.5 million years ago. Now Elbrus is no longer active. And according to the global volcanism program, the last eruption occurred around 50 AD. This is based on the discovery of evidence of volcanism. That is the lava flow on the mountain that looks fresh with the longest longest flow 24 kilometers on the northeastern peak, indicating a large eruption. In addition there are also other activities on Mount Elbrus, namely solfataric activities (i.e. smoke due to sulfur flow) and hot springs. The western peak has a well-preserved volcanic crater with a diameter of about 250 meters. In 1956, to celebrate 400 years of the merger of Kabardino-Balkaria, the Autonomous Soviet Socialist Republic, where Elbrus was located, held a mass ascent by 400 climbers. Of course this activity becomes its own history for Russia. This is a sign that they are very loving and proud to have Mount Elbrus. This is a fact that you are definitely waiting for, hiking lovers. For those of you who are interested in visiting Mount Elbrus, there are many tourist routes that you can take. The easiest normal route to take is by cable car and chairlift which starts operating at 9am to 3pm. A cable car will take you from the Diesel Lodge or Leaprus Cottage. Then for the climbing route, then climbing Elbrus from the south takes around 6-9 hours. From Terskol Village, one can walk 5 km to the first height, namely Azau with an altitude of 2,350 meters. The cable car service is available from Azau to its normal starting location for climbing Elbrus, which is known as Barel Hut or Garabashi Station. The next destination is Diesel Shack at 4,050 meters. From the Diesel Shack, the route leads straight towards the eastern peak of Elbrus, continuing south to the slope. After that, you can climb and will pass through the sloping basin filled with snow. Down from Elbrus spent 3-6 hours. Many climbers try to reach the peak of Elbrus. However, during the winter, there is a problem due to the cold weather. And there are 15-30 climbers die every year. The first climbing race held at Mount Elbrus took place in 1990. Soviet climbers competed against American climbers. This race was won by Anatoli Boukreev, and Kevin Cooney was second. And Patrick Healy is third. The 11th prime route (4050 meters) is summarized in 1 hour and 47 minutes. Not only this. In 2005 and also the 2010 climbing race was held. This race is of course equipped with safe facilities by the event committee. In 1929, eleven scientists set up a small hut at 4,160 meters and called it Priyut 11. In the same place, a larger hut was built in 1932. But this hut has collapsed, and its remains can still be seen if you visit Elbrus. In 1939, the Soviet tourist travel agency built shacks on the location Priyut 11 first. At an altitude of 4200 meters coated aluminum to accommodate the western tourists who would make the climb on Mount Elbrus. Shortly thereafter, the lodge was converted into a mountain barracks for Soviet army forces in World War II. And in 1998, this cottage burned down because of a cooking stove that had fallen. And finally, in the summer of 2001, a few meters below the ruins of the mountain barracks, built hut Diesel. So named because it is located on the site of a former diesel generator station. And it is this Diesel Hut that still exists today and is often used by climbers to rest. Elbrus is known for its extreme climate. And if you want to go to Mount Elbrus, then you should go in July-August. At this time the weather at Elbrus is stable. Even in the summer only, nighttime temperatures in Elbrus reach 18 F (-8 C). really extreme weather, you can certainly imagine how the weather on Elbrus when winter came. So, for those of you who want to vacation on Mount Elbrus, you must prepare wore thick for your safety. And don’t forget to bring medicines to deal with if something happens. That’s the 7 facts about Mount Elbrus – the highest mountain in Europe. These facts are indeed very impressive. And from these facts, we can conclude, that Mount Elbrus ever witnessed the World War II. And for lovers of Russian nature, do not miss to visit Mount Elbrus, you must be very amazed by the grandeur.